“Uncle” is what Hawaiian kids call older family friends. Turns out Zane had just finished doing a Viento run on his foil board. He told me it took about ten minutes to really get going, but his run was 55 minutes. I mostly paddle an unlimited board, and all summer long when the wind is howling I do as many as five to ten of the eight-mile counter current Viento runs a week. I’m not the fastest guy on the river, but I’m not the slowest. A good run for me is 1:20. A spectacular run for one of the pros or semi-pros that show up for the Gorge Paddle Challenge is anything just under one hour. Fifty-five minutes is insane–especially for the first try. Insane Zane. Fuzzy screen grab from fuzzy video of Zane on a Gorge foil run. 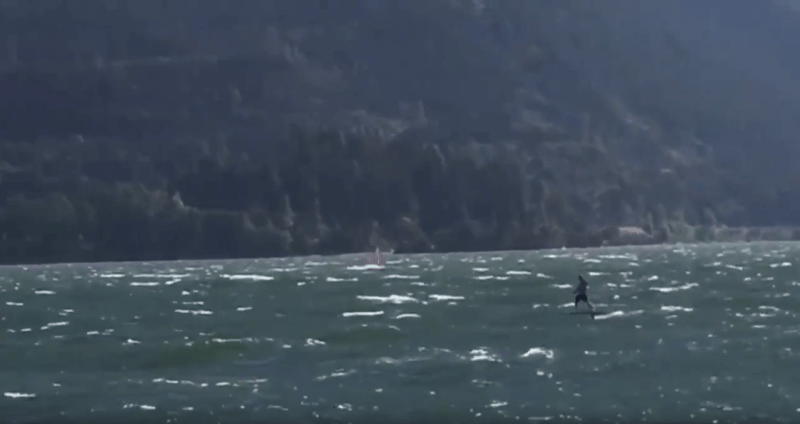 The day after the Paddle Challenge I joined videographer Rod Parmenter on the bluff at windsurfing spot known as The Hatchery to watch Connor Baxter, Chuck Patterson, and the two up-and-coming SUP groms Jeffrey and Finn Spencer ride waves on foils. The swells were not the biggest the hatchery can serve up–on a big day some Hatchery swells can be mast high. But Conner was catching swell after swell, riding them a hundred yards or so, and then dropping down on his board to ride the current and paddle back to the starting point. After a few false starts the Spencer boys were doing the same, riding two feet above the water, looking like Marty McFly on his hover board. Chuck–not so much. Anyone that knows Chuck Patterson knows his skill level for anything in the water is off the charts. And his struggle was certainly not for lack of power–the guy looks like an action figure in human scale. I concluded that it was simply his weight. Chuck is probably over 210. If there’s any fat on him, it’s hiding well, but he’s a big guy. I came to two conclusions: A. 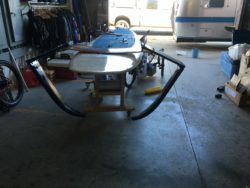 For big guys, foiling on SUP using a bigger kite-type foil is going to be a very marginal thing. And B. I want to do this. I weigh 235, and it’s not all muscle (my friends are laughing uproariously), I’ve been doing standup for more than ten years, but I’m 70. I have geezer balance, a bad knee, and trashed shoulders. The only way this was gonna work is to cheat and build something that doesn’t require any more balance and ability than my current capability in doing downwinders. I read a couple of books on the subject, learned to do foil calculations, and looked at the pros and cons of a lot of different designs. Near the end of last summer, I decided to simply start making stuff and see how things worked out. Is anyone surprised that attempt #1 sucked out loud? The foils flexed too much. The shortcut I took in using a mountain skateboard body as the cross piece let the foils flex vertically–I intended that–but it also let them flex forward and back, and that made the board unstable. It flipped over viciously at about five MPH. So that’s not working. In the next installment: GF2.